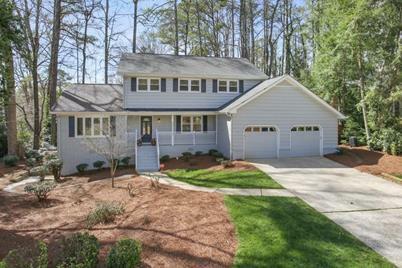 Inviting Hampton Hall home with incredible curb appeal and a rocking chair front porch. Enjoy hardwood floors and sun-drenched interiors. The updated kitchen offers cabinets to the ceiling, granite counters, a gas range, a breakfast are with a bay window and sight-line views to the fireside family room and backyard. Incredible daylight finished basement with crisp, white walls, dark floors, wet bar, and full bathroom with outside access. Relax outside on the rear deck overlooking the large, lush, fenced backyard with a play area, treehouse and storage shed. 3492 Hillstone Court NE, Atlanta, GA 30319 (MLS# 6512722) is a Single Family property with 4 bedrooms and 4 full bathrooms. 3492 Hillstone Court NE is currently listed for $629,000 and was received on March 01, 2019. Want to learn more about 3492 Hillstone Court NE? Do you have questions about finding other Single Family real estate for sale in Atlanta? You can browse all Atlanta real estate or contact a Coldwell Banker agent to request more information.